MattAmity90 wrote: So statistically on the Babylon Branch it was Unqua Rd. in Massapequa. Would you count any crossings in Babylon, RT. 110/Broadway in Amityville, Park Blvd. in Massapequa Park, Hicksville Rd. in Massapequa, any crossings in Wantagh, Bellmore Ave, Merrick Ave, and Babylon Turnpike in Merrick as very hazardous? Out of all those crossings I know one very well as it it's in vincinity of the college I used to attend. That crossing would be wicks Rd in Brentwood. That line should've been built like the Babylon Branch. All raised to Ronkonkoma. Hate that crossing so much as when I would be traveling on the bus from school to home I would miss my connection at the Brentwood Railroad to another bus because of all the traffic through their. I know of crossing # 2 as well and #4. Regarding that story about the Man and his girfriend killed a week apart, same train, same Engineer a week apart. The third week a few crew members were standing up front and the Engineer said... "Come out come out wherever you are.." thats the way we dealt with stress in those days. I feel so bad for that engineer that died on the same day he hit the cyclist, and the engineer that hit those two kids within 7 days, someone told me that one. LB, those pictures aren't that bad, I can clearly see the tracks, and I had no idea that the decoration around the station was important. So the most dangerous crossings were Unqua Road, Park Blvd, Bellmore Ave, Centre Ave, and Merrick Ave. Man that is close quarters from Sunrise Highway to the tracks (Don't even think about sticking your arm out the window kids!). Now LB, you mentioned you like the 2 photos of the LIRR crew cutting out the temporary tracks and connecting them to the new elevated ones. Does that mean for about a week or 2 weeks at the Bellmore-Merrick, Massapequa Park, and the A/C/L segments on their elevated station's opening day of service that while they were cutting in the tracks, that one of the temporary tracks was in service, while one of the elevated tracks was put into service? I know they did that at Rosedale, Wantagh, and Seaford. 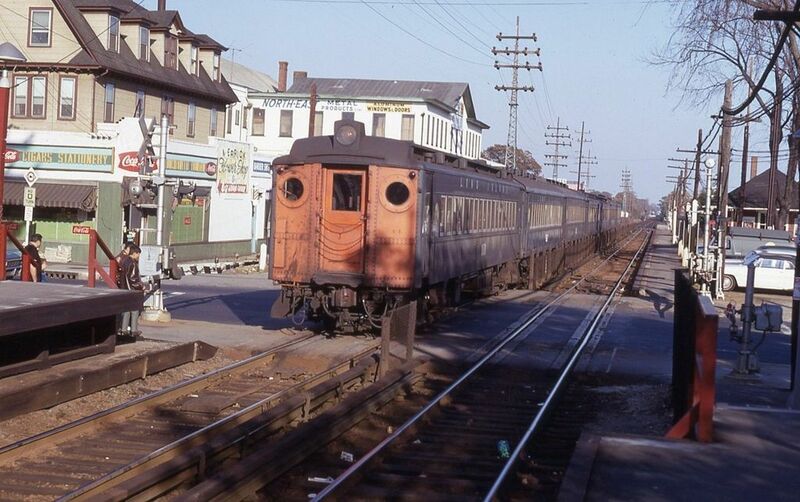 Also like you said, that when Amityville was elevated, the interlocking was also built, so that would put the temporary tracks starting just East of the Sunrise Highway trestle and the current substation. 50 Inches from the top of the rail to the bottom of the doors. MattAmity, I'm not sure how long Merrick/Bellmore or Massapequa Park ran in the split configuration. I'm guessing not more than a day or two since they usually started the track cuts over the weekend, possibly as early as Friday evening. Only a statistic I had was for Wantagh/Seaford, as you probably noted in a previous post. LB wrote: Last places I remember dual planked gates into the 1990's were Merrits Rd (Farmingdale), Broadway (Bethpage), Herricks Rd (Mineola), Glen ST (Glen Cove), Lowell Ave (Central Islip) and RTE 111 (Cental Islip) and several Hempstead Branch locations. They were found just about everywhere up to the mid-1970's. They seemed sturdier than the existing fiberglass gates, especially for longer gate lengths. Here's an example of a fairly long set of dual planked gates at Syosset. Sadly no one has come up with pics yet. The Unqua Road incidents were both deemed suicides. The engineer was a former NYC cop. Pretty tough guy. ACL elimination had both tracks swung from the temporaries within hours of each other. I don't remember about M/MP. LongIslandTool wrote: The Unqua Road incidents were both deemed suicides. The engineer was a former NYC cop. Pretty tough guy. Good old M.M. " the infedel"
Man, within hours of each other they worked quick, probably with the help of those jumper cables and all those people you saw with new ties and rails at the ready. Those two photos taken from the Meadowbrook look like they were taken on the same day LB, the one you like with the M-1 on the grade track, then the one where they are cutting in the Eastbound in with the M-1 on the Westbound elevated track. 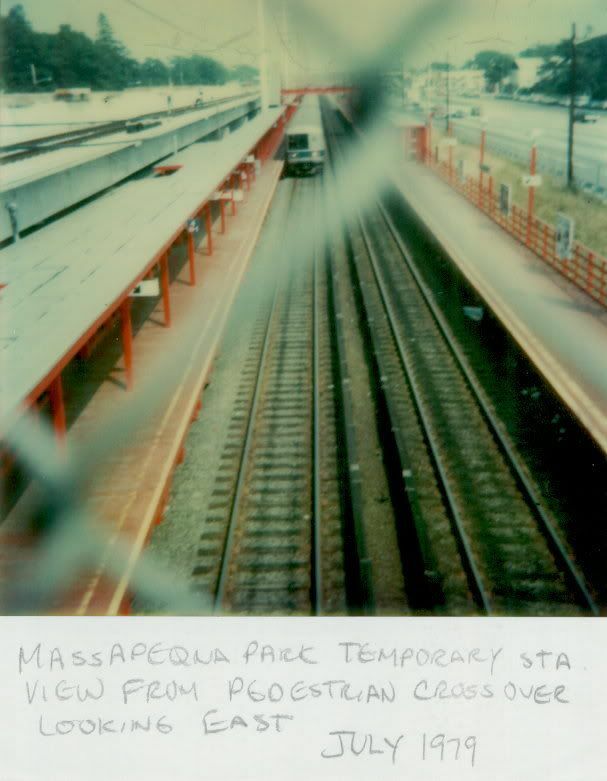 That also goes the same with the photo taken West of Massapequa Park on December 13th, 1980 opening day, with the M-1 on the Westbound elevated track, with another M-1 at the new station in the distance. So for a little bit, in Amityville and at the other end of the 4 mile stretch of the ACL segment, they had one grade level track in service and one elevated track in service. Doc mentioned that there was a grounding problem with that section that required track work for a couple of months, but the temporary tracks had already been torn up? When the elevated opened did they start dismantling the grade level stations immediately? 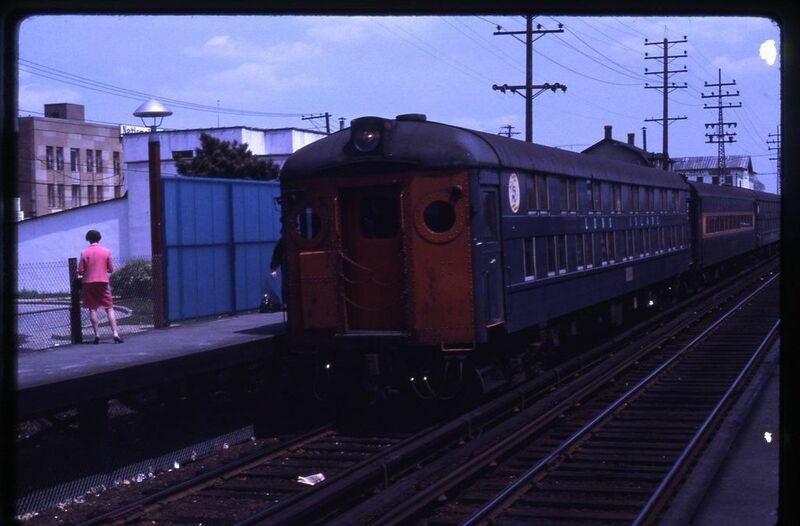 I know Dave Keller took a photo of the station in service from the walkover bridge at Amityville and Lindenhurst and I was wondering if anyone knew how close the roof of the train cars were below them and on that angled staircase, which I know had plenty of clearance. 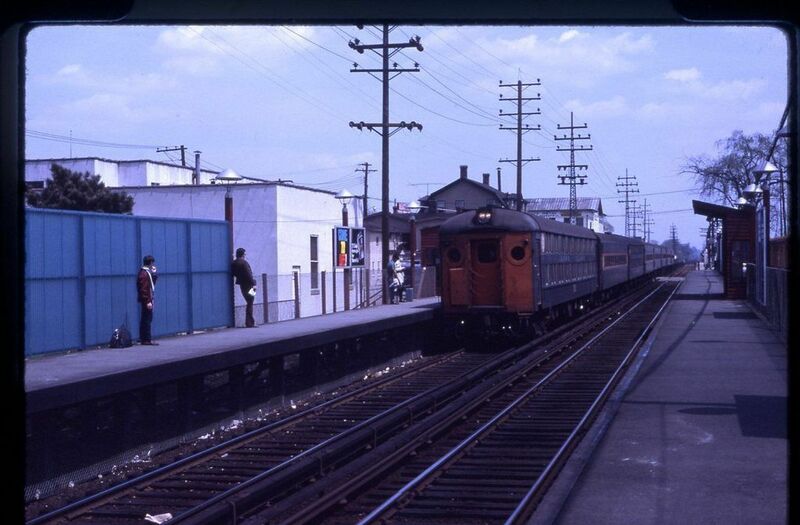 Plus since I found two photos (one at Lindenhurst and one at Copiague) the Eastbound platform with the angled staircase had the 4-6 M1 signs, and since they were of identical construction and they were painted red from someone that lived there that means Amityville had those as well, it's just there isn't a photo of Amityville in 1971 or 1972, just 1960's photos and one from 1973. You won't find any photo's of the A/C/L projects in the local town papers. Back in the 1970's, when I researched most of this, the Merrick/Bellmore/Wantagh/Seaford papers had articles and photos chronicalling the projects. The late June '75 issues of Merrick/Bellmore life had a big commenmorative special edition with many pages of photos from the project. All those newspapers are gone now, with only microfilm remaining. 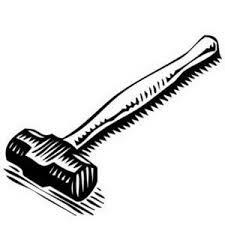 I would suggest the Amityville historical society if you want to dig deeper. Another great research source is the Long Island Room at the Queensboro Public library, a short walk from Jamacia station. They have the bulk of the Ron Zeil collection and some others in a digital data base. Most of the stuff however is pre-1960. A few days after the Massapequa Park temporary station closed, I went back for a reconnaissance visit. The grade crossing signals were gone and the entrance way stairs to the temporary station were boarded up. I would guess within a week or two they were ripping out the temporary stations and tracks. Someone asked earlier about the current names of the Mineola area interlockings. I believe they are simply known as Nassau 1,2, and 3 going from west to east. Nassau streachs from roughly MP 16.5 to MP 19.5 on the Mainline,On the Oyster Bay Branch to MP 19.2. Note: all MP's are from LIC. Got a new M1 photo taken, credit to Paul F. De Luca. Massapequa Park June 18th, 1979. Nice shot of MASS PARK in JUN 79 (brings back fond memories). Here's a few from Merrick 68/69.